All Thunder Sixty-Six tour guides are highly trained motorcyclists with years of on road experience. They have undergone specific sidecar training for in town, open highway, and mountain navigation. Riding with our expert cyclists, you’ll be able to rest easy and enjoy the ride. All sidecars are equipped with seat belts and the latest safety features the biking industry has to offer. We provide DOT approved helmets for all riders and first-aid kits on each bike. Hearing protection will be available if desired. Am I allowed to drive the motorcycle? 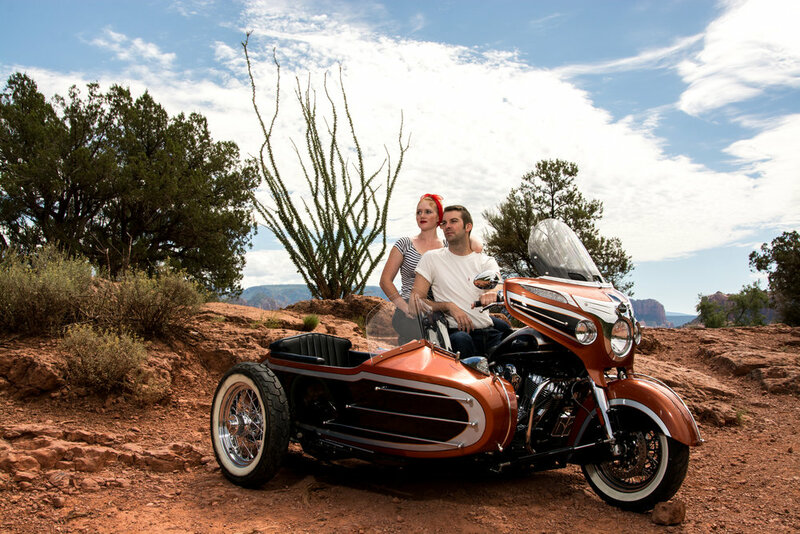 No, we have trained tour guides to take you on elegant rides so that you can fully enjoy the beauty of Sedona! Yes, we can not take any children under the age of 10 years old for safety precautions. Everyone 10 years old and above are welcome to ride with us! Yes! Sidecars are very safe. They are bigger and much easier to see, have 3 wheels, which makes them much more stable, and are equipped with a multitude of safety features. The bikes may look vintage but they are 2015 or more recent, so they are built with modern day technology. Can I book tour rides for special events? Yes, we would love to work with you to prepare a special event geared towards all your needs, whether that may be an exciting birthday surprise, a romantic date night, or a wedding special. We are open to customize a special-event ride- just give us a call so we can work something out! Do you do tours in Winter? Yes, Sedona’s winter season is normally quite mild, enabling us to give a cozy winter ride, provided the temperature is not too low and that you are dressed properly. Warm clothes, gloves, scarf, pants, boots, and most importantly, warm socks! Never underestimate the power of good socks! How many people can ride on each bike? Our motorcycles comfortably fit 3 people total: Your tour guide and one passenger will be seated on the bike itself, while the sidecar will seat the 2nd passenger. Both guests will have the opportunity to switch seats halfway through the tour so you each get to experience both the sidecar and bike! Will my tour be canceled if it rains? Weather comes and goes quickly, so, if there is rain, we will attempt to wait it out. We will still operate in light rain, but if there is a downfall, we will do our best to accommodate any inclement weather issues. Each passenger is required to have eye protection (sunglasses), wear pants and closed toe shoes. No loose articles of clothing! We recommend tying long hair back. A DOT approved helmet and eye protection (if necessary) will be provided. Don’t forget to wear sunscreen! The Arizona sun can be unforgiving! There is weight limit for the sidecars and bikes. We can seat up to 280 lbs and 7 feet tall, beyond that it becomes a safety issue. There is a 48 hour cancellation policy for a full refund. If you cancel within 24 hours you will receive a 75% refund. No shows and late arrivals won’t receive a refund. Please arrive at least 20 minutes before your departure time!